Manufacturer: PROTECTIVE INDUSTRIAL PRODUCTS, INC. 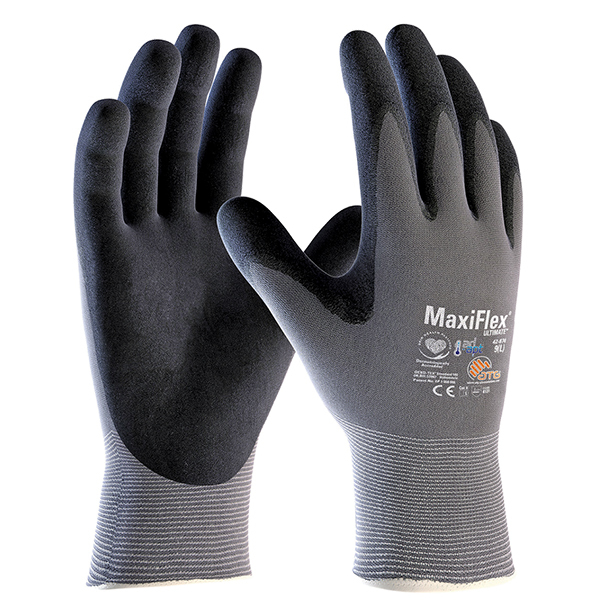 These Large MaxiFlex Ultimate Cooling Gloves provide top of the line comfort and dry grip. They are made with AD-APT™ technology which helps to keep hands 31% cooler than the standard MaxiFlex Ultimate gloves. The AD-APT™ technology releases mircroencapsulated natural cooling agents as the temperature rises in the palm area of the glove. This helps to ensure your hands stay dry, comfortable and productive throughout the day. The patented AIRtech® channels provide the gloves with the ultimate ventilation. MaxiFlex Ultimate gloves have micro-foam nitrile coated palms and fingers, which give you excellent grip and dexterity, especially in chemicals such as oils, petrochemicals, fuels, and most acids. Learn more about MaxiFlex Ultimate Cooling Gloves in our New MaxiFlex Ultimate Cooling Gloves blog article. It explains how AD-APT technology works, the best situations to wear cooling gloves in, a glove size chart, bulk buy information, and why we love these gloves at Equiparts.